Forever is tiring to watch, says Paloma Sharma. Writer/producer Matt Miller, who has worked on shows like Las Vegas and Chuck, brings to small screen audiences the tale of a man who just cannot die. Oh, and he’s a medical examiner too; in New York, of all places. Looks like you’ve seen it all before? You might have. The show, all 22 episodes long, is bound to break a few hearts considering there is no second season to look forward to. ABC cancelled the show after one season and that, one believes, may be good for all of us. 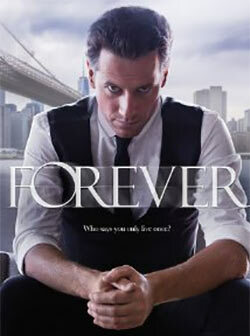 Forever is the tale of Dr Henry Morgan (Ioan Gruffudd) and his quest to find a way to break the curse of his immortality. About two hundred years ago, Henry was a doctor on a ship carrying slaves from Africa, to be sold into bonded labour in the Western world and its colonies. While trying to protect a captured man from being thrown overboard by the masters of the ship who believe that the man is ill and will infect the other slaves, Henry is shot dead and thrown into the raging sea. However, he does not die. He merely reappears, alive and naked, in a body of water (and, we learn later, he shows much contempt for the term “rebirth”). From then on, the cycle repeats itself. Although the doctor does feel pain, fear, love, happiness and guilt, neither does he age, nor does he die. From then on, Henry devotes himself to the study of death. Morbid as it may seem, he says he does it merely to find a cure to his ‘sickness’ and so, he ends up taking up employment as a medical examiner for the New York City police force. With the skills he has learned over the years and the time he’s had to polish them, Henry’s acute observation and vast knowledge of pretty much everything under the sun aids him to see the invisible and solve the impossible. Add to this a tough as nails, brooding homicide detective with an affinity for alcohol and viola! You have your run-of-the-mill cop show. With each new episode comes a new case for said officer, Detective Jo Martinez (Alana de la Garza), and Dr Morgan steps in with his expert knowledge of both human anatomy and human behaviour and saves the day. Each episode of Forever follows the format so closely that, if you’ve watched enough crime shows, you’ll be able to solve the whodunit by giving the script a casual once over. The concept and style of the show, even the characters, seem to have been pieced together from various other shows. The character of Dr Morgan with his aloofness and inability(/unwillingness) to deal with emotions reminds one strongly of Dr Temperance Brennan of Bones and Detective Martinez’s street smart cop dealing with a traumatic past seems to be modelled on The Mentalist’s Teresa Lisbon or Castle’s Kate Beckett. Dr Morgan is more Sherlock than a “lab rat” and Detective Martinez, despite having more experience in the field, is more often than not clueless about her own work. The circus is tiring to watch. So is the show’s constant hammering about the difference between living and being alive. Add to that random flashbacks to all of Dr Morgan’s previous lives and you have a story that refuses to unravel. Forever takes its own time in providing whatever little clues that it does, condemning the viewer to eternal wait and an eventual loss of interest. Although the series is well shot and the soundtrack is recommended for easy listening, the show moves at its own pace, forgetting that unlike its protagonist, its viewers don’t really have forever. Forever airs on Colors Infinity every Wednesday at 9 pm.